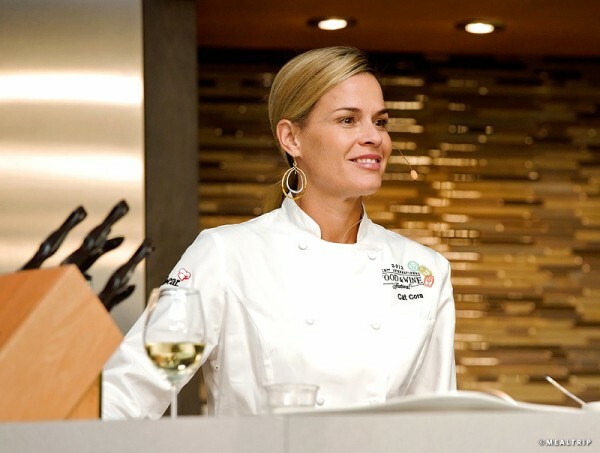 Cat Cora Fans, it looks like you’ll have a reason to rejoice for the 2017 Epcot Food and Wine Festival! 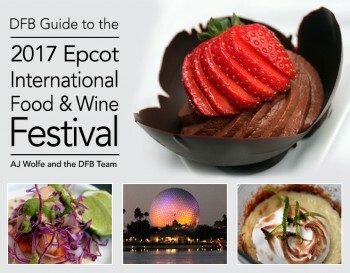 You’ll also want to keep a close eye on DFB and plan to be up extra early the morning that booking opens for 2017 Epcot Food and Wine Festival Special Events! We think that points squarely to the fact that Cora will be featured as part of the popular “What’s Cooking With” series. “What’s Cooking With” events include cooking demos by chefs and other celebrities. After the demonstration is complete, the chef sits down with a host and shares a little about his or her story and the demonstrated dishes. 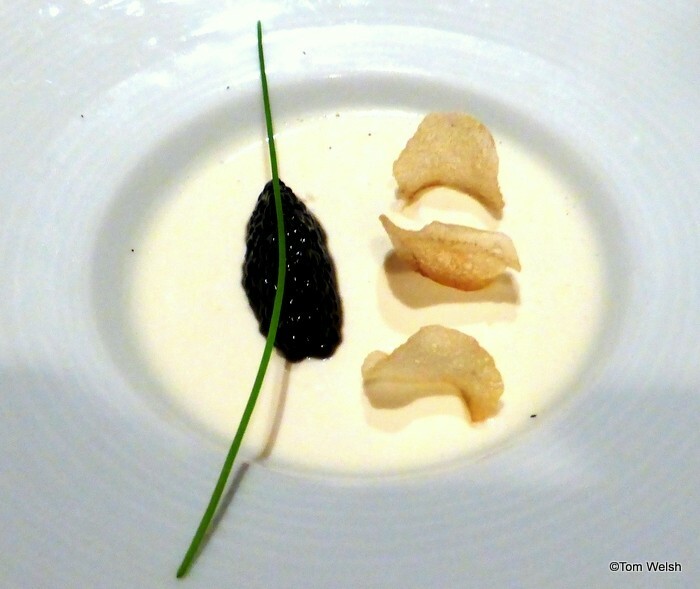 The audience has the opportunity to try a menu of dishes that the chef has prepared, along with beverage pairings. 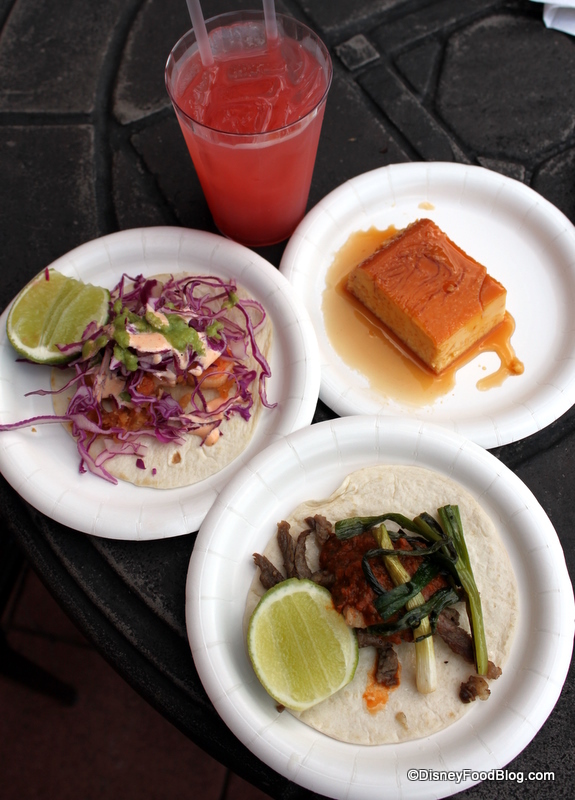 We’ve had the chance to enjoy several similar events, including demos by Chef Norman Van Aken and Chef Rick Bayless. 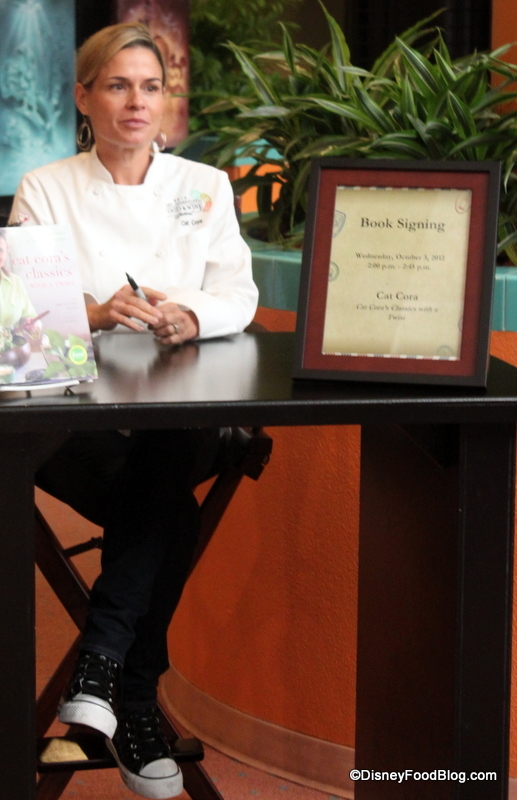 Currently, the dates to watch for Chef Cora are Friday, October 20, and Friday, October 27, from 9:45AM to 11:45AM. These are subject to change. And don’t forget — you don’t have to attend any of the events that chefs are appearing at for a chance to get in on a meet and greet. Just visit the Festival Center on the day that your favorite appears (the earlier the better!) to request a wristband, and line up for your chance to chat with your favorites and get their autographs. Want Even More Details About the Festival? To book all special events and demonstrations, call 407-WDW-FEST (939-3378) starting TBD. Join the Disney Food Blog Newsletter to find out as soon as we do about details and booking dates! Culinary Demonstrations and Beverage Seminars and general admission for some special events may be bookable online at www.epcotfoodfestival.com as well as by phone. Tables in Wonderland members, Annual Passholders, Disney Vacation Club Members, and Golden Oak Residents may be eligible for a $2 discount (per person, per event) for beverage and seminars and culinary demos taking place Mon-Thurs during the festival. These members will be able to book seminars and demos TBD. Discounts are by phone only at 407-WDW-FEST (939-3378). Stay tuned to DisneyFoodBlog.com and the Disney Food Blog Newsletter for details. Chase Disney Visa Cardholders can book select special events, demos, and seminars on TBD as well. A limited number of seats are available for the booking date. Are you excited to see Chef Cat Cora return once again to the Epcot Food and Wine Festival? Leave a comment and let us know if you’ll be attending one of her cooking demos! Today we are sharing a pictorial review of the new Victoria and Albert’s Ten Course Tasting Experience from guest photographer, Tom Welsh. Thanks, Tom! 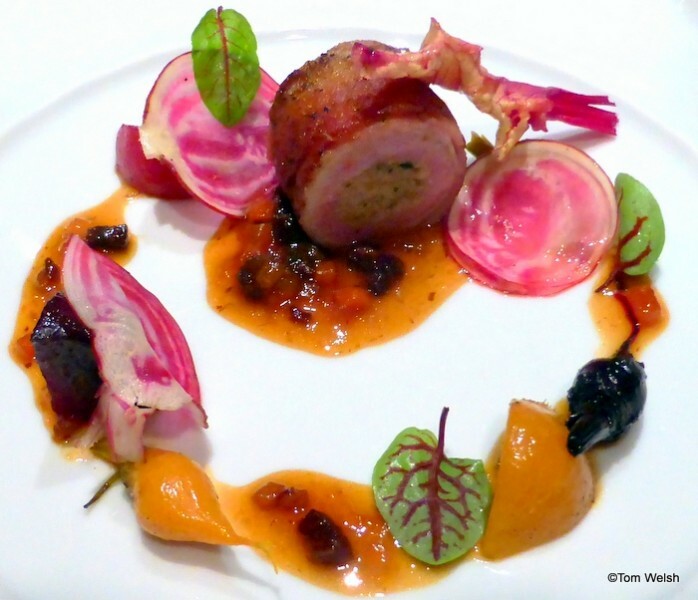 Let’s take a closer look at a Chef’s Ten Course Tasting experience at Victoria and Albert’s. This award-winning restaurant at Disney World’s Grand Floridian Resort exudes elegance and is helmed by James Beard Award-nominee (again in 2016!) Chef Scott Hunnel. We took the monorail over to the Grand Floridian Resort for our dinner at Victoria and Albert’s. Viviana and Sharon greeted us at the door with hugs for all. Sharon introduced her associate for the evening, Anita. We also met Elizabeth, the harpist. 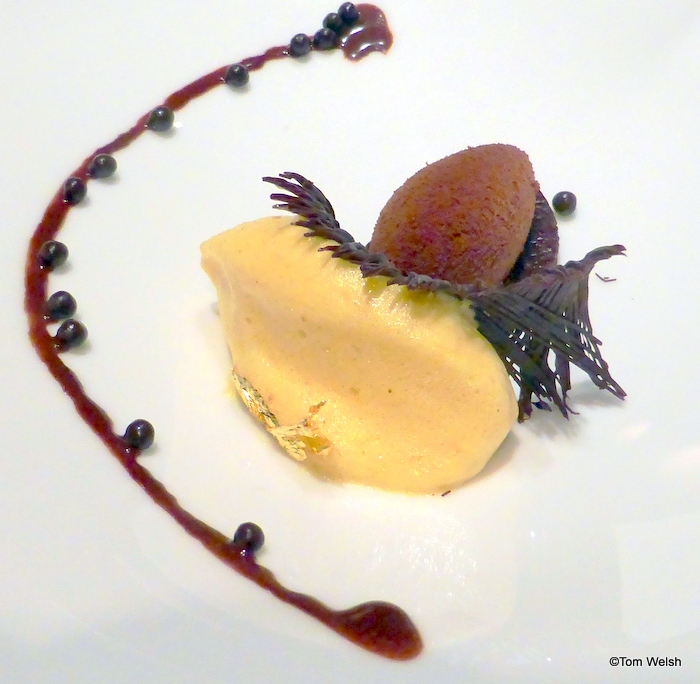 We selected the Chef’s Ten Course Tasting Menu with the recommended wine pairings. First came a lovely fruit punch with a little vodka. 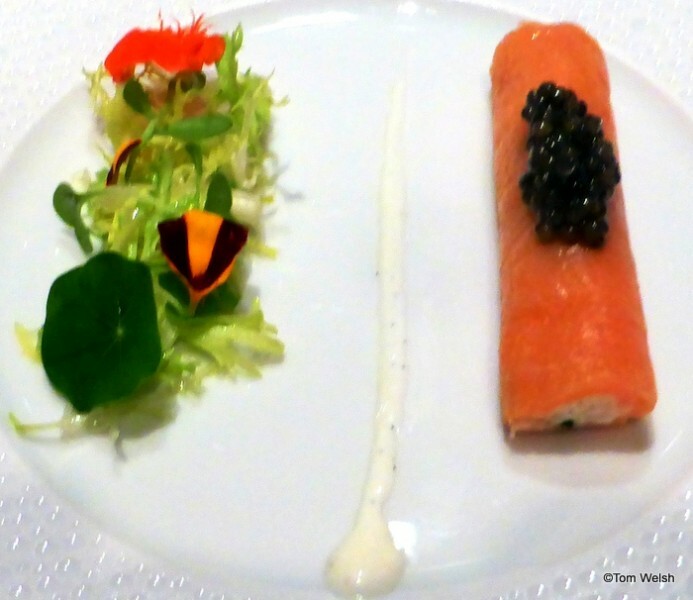 The nine courses that followed were: (2) Roulade of Smoked Salmon and Alaskan King Crab with Chateau Rahoul Blanc, Graves 2011. 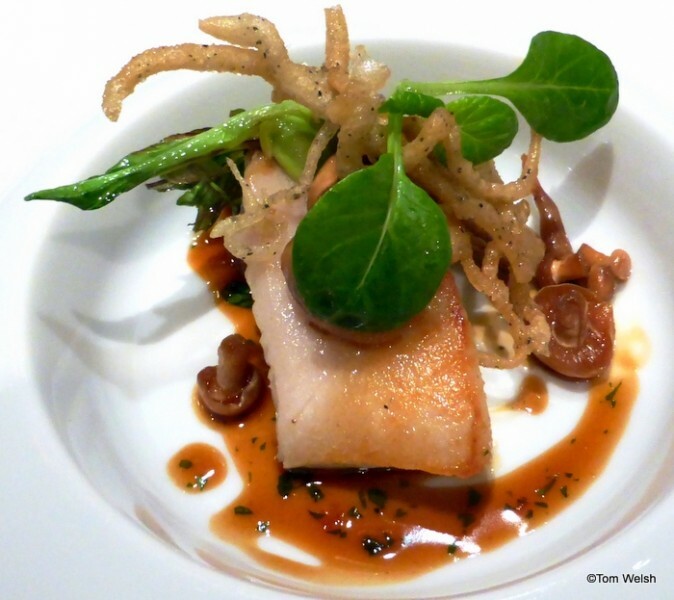 (3) Alaskan Sablefish with Baby Bok Choy and Lieu Dit Chenin Blanc, Santa Ynez Valley 2013. 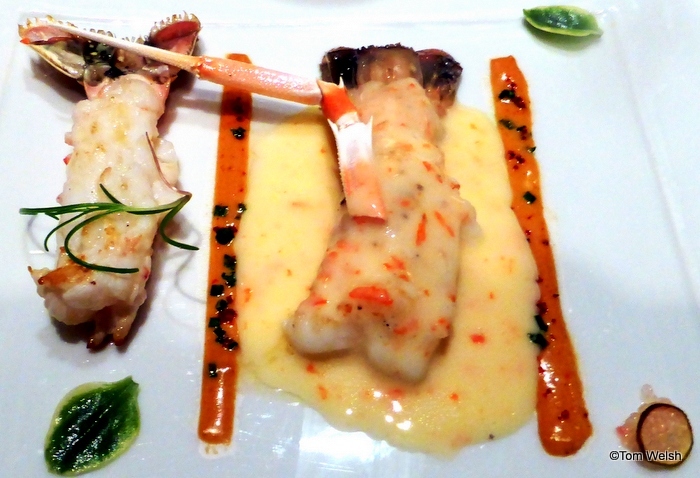 (4) Scottish Langoustine with Nage Crema and Hanzell “Sebella” Chardonnay, Sonoma 2013. 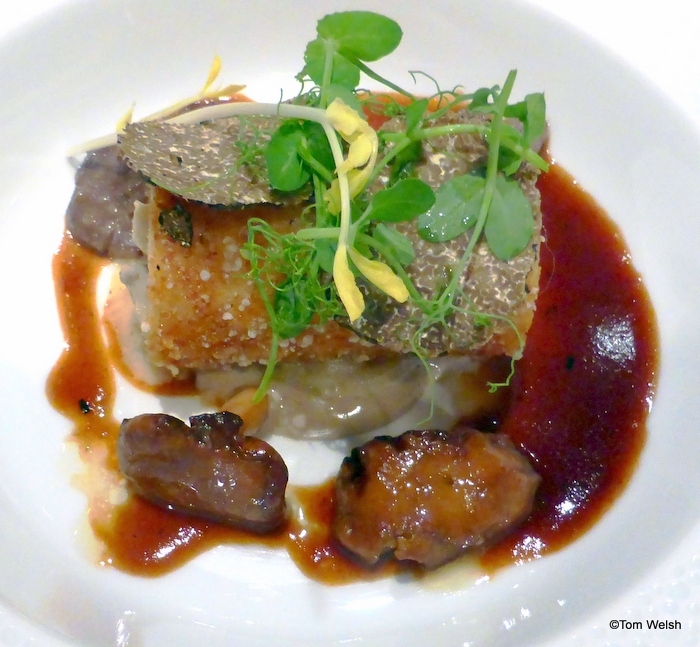 (5) Truffled Bell & Evans Chicken with Hedgehogs (mushrooms) and Copain “Les Voisins” Pinot Noir, Anderson Valley 2011. (6) Berkshire “Porchetta”, Sherry Vinaigrette and Arboldea Carmenere, Colchagua Valley 2009. 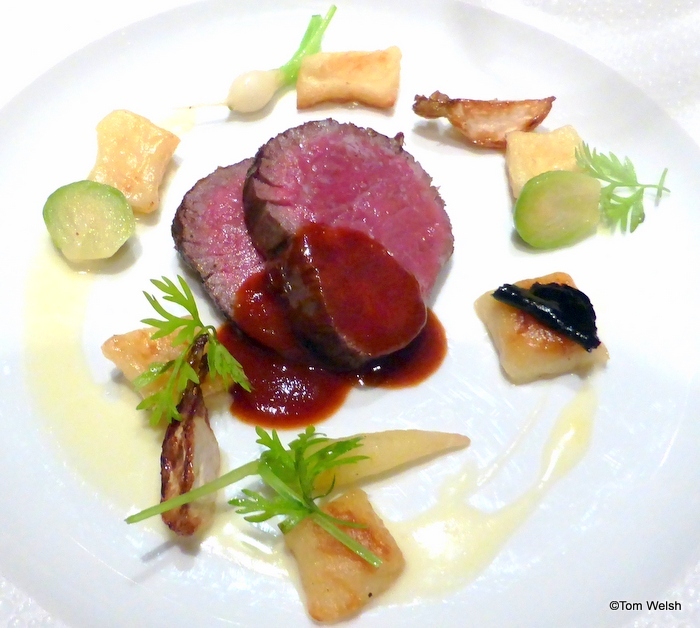 (7) Australian Kobe-Style Beef with Comte Potato Gnocchi and Chateau Rauzan-Segla “Segla,” Margaux 2008. 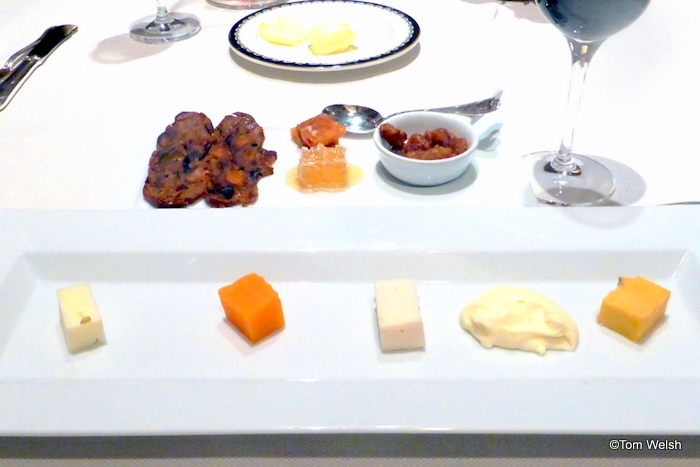 (8) Selection of Cheese from the Trolley with Quinta Do Crasto Late Bottled Vintage Port 2010. 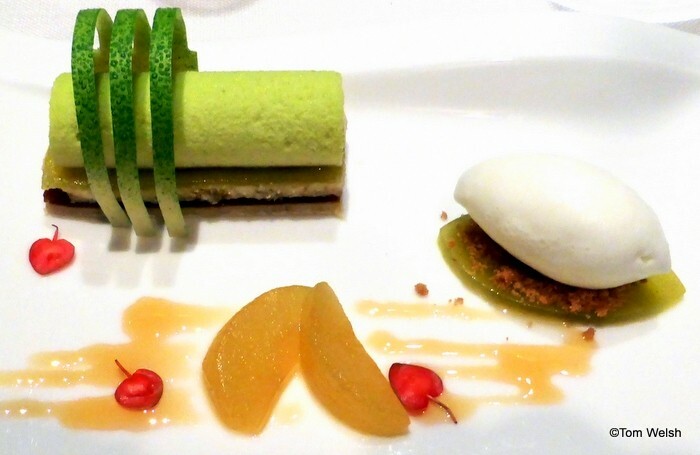 (9) Green Apple Mousse with Sour Cream Ice Cream. We each had a pot: coffee for Lyd and tea for me. Thanks for sharing your meal with us, Tom! Is Victoria and Albert’s on your Disney Food bucket list? Let us know in the comments below. 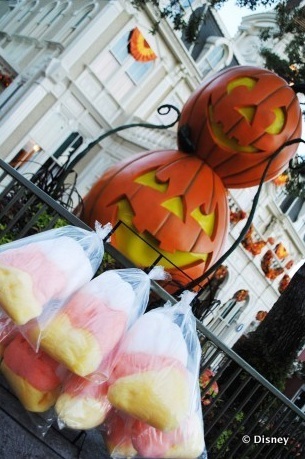 Fall is in the air at Walt Disney World where the Magic Kingdom has transformed into a Not-So-Scary setting for the annual Halloween parties. 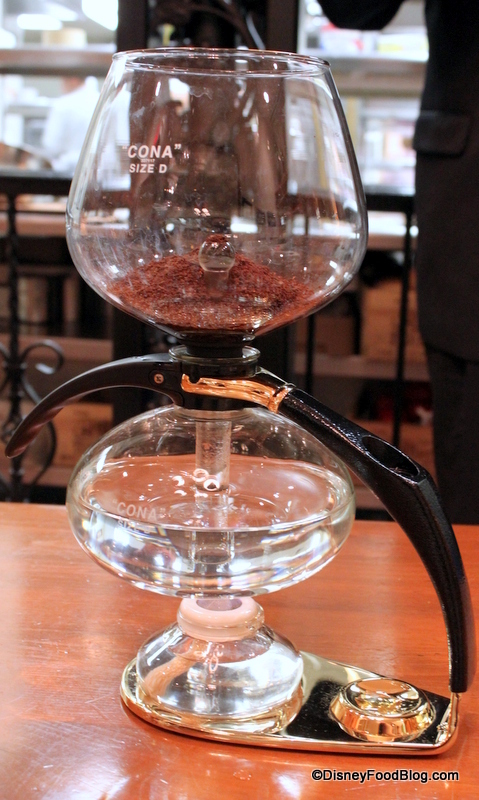 Not only do we love the decor, we are quite fond of the special food and beverages that have begun to materialize. Check out the exclusive treats and drinks you can expect to see at this year’s Mickey’s Not So Scary Halloween Party at Walt Disney World’s Magic Kingdom! Signs of autumn are upon us all as we travel to all four Parks in Disney World to see What’s New! Pizzafari in Disney World’s Animal Kingdom debuted three new items on the breakfast menu. We’re trying the Breakfast Burrito, Breakfast Croissant, and Ancient Grain Hot Cereal. Disney World’s Beach Club Resort announces wine pairings on select dates at Martha’s Vineyard Lounge. Check out all the latest Disney Food News — even the stuff we don’t mention in posts on the blog! — on our Disney Food News Pin Board, including restaurant closures, Rix Lounge Party at the Coronado Springs Resort, and more! 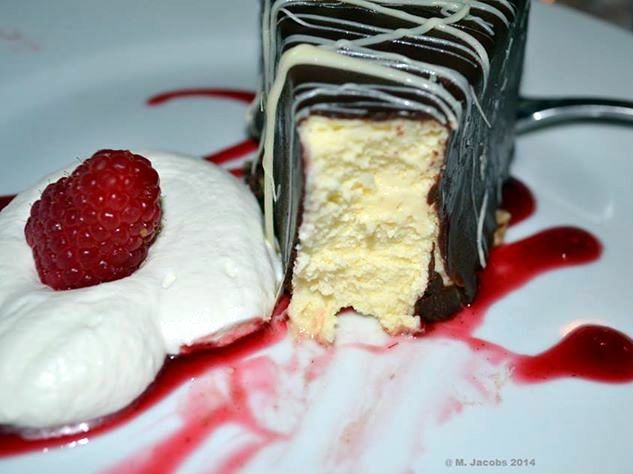 This week we’re sharing desserts from Disney’s Vero Beach Resort! 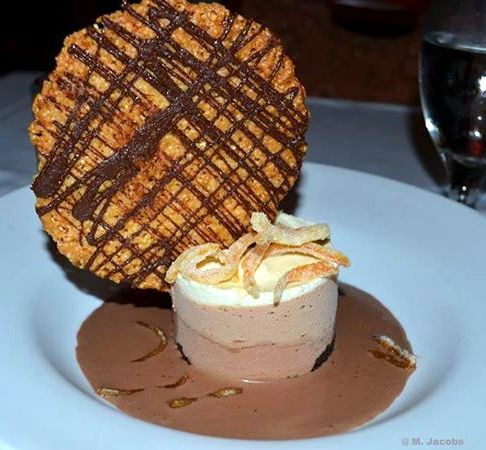 Facebook Friend Margaret tempts our appetites with these gorgeous desserts — French Style Vanilla Cheesecake and Triple Chocolate Semifreddo! 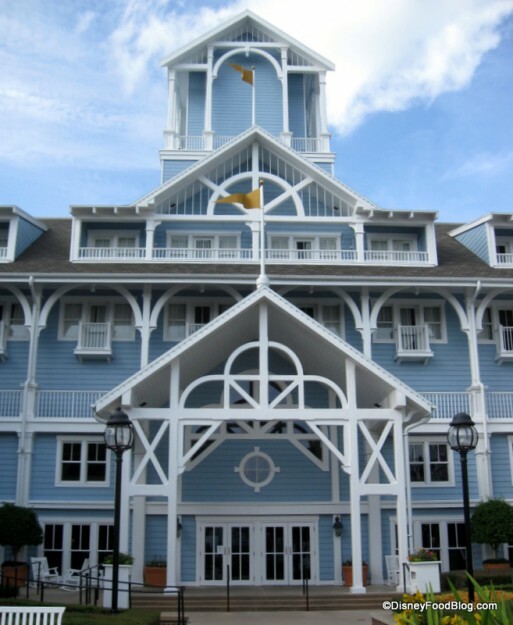 If you’ve been hoping for a reason to spend a little more time at Disney’s beautiful Beach Club Resort, you just may have one now! Martha’s Vineyard Lounge is hosting wine pairings on a few select dates. 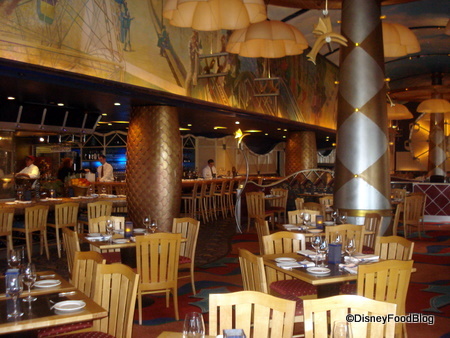 The Flying Fish Café at Disney’s BoardWalk Inn Resort has announced the first dinner for the 2013 Winery Series! Be sure to block off Wednesday, January 30th, 2013, on your calendar for this fun and high end meal! 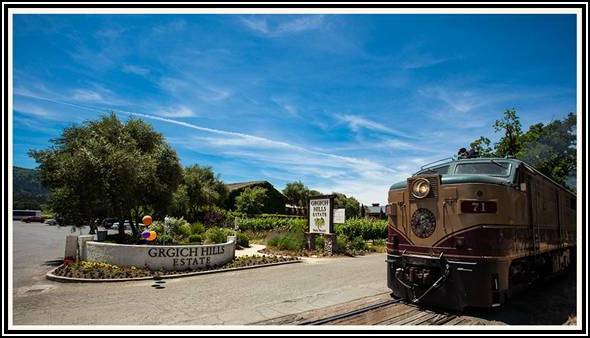 Featuring the Exciting Wines of Grgich Hills Estate – Napa, California. 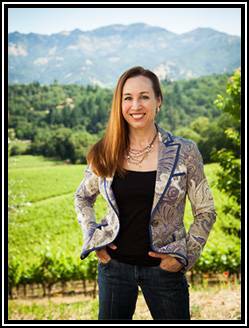 Violet’s passion for wine began at an early age, as she grew up accompanying her father in the vineyards and cellar. She spent her summers at the winery, doing everything from bottling line work to laboratory analysis and working in the tasting room. The Flying Fish Café Team at Disney’s Boardwalk Resort has scheduled a July Wine Dinner! Also, Winery Series events that will take place during the 2012 Epcot Food and Wine Festival have been announced (including a brand new dessert-focused event)! This Winery Event will take place July 26, 2012. Special Guests Ronald and Marianne Lachini –- Founders/Owners of Lachini Vineyards in Newberg, Oregon — will be on hand to greet guests. 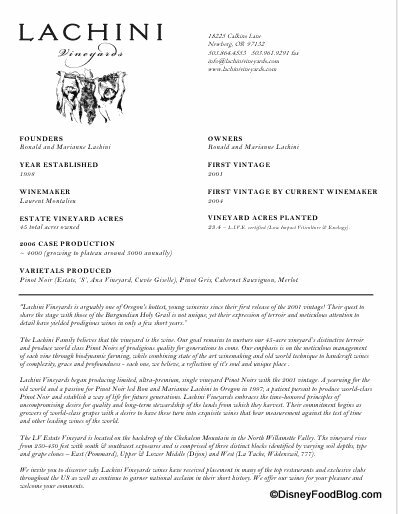 Lachini Vineyards Bio - click image for larger version. 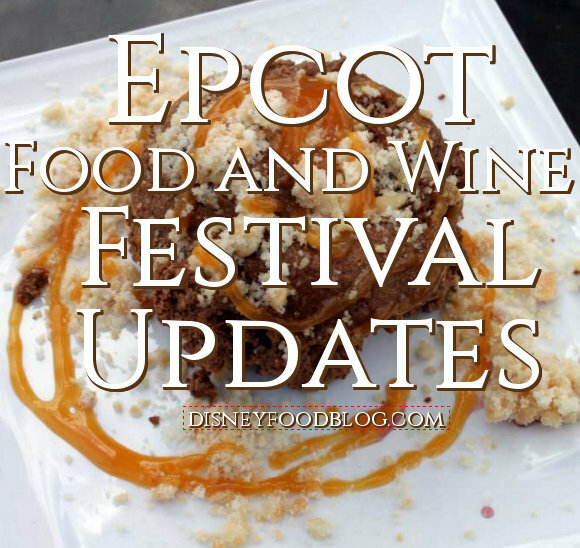 The 2012 Epcot Food and Wine Festival is coming up soon, and we’re already covering the latest news about the event. You can “follow the festival” on our Food and Wine Festival page here, and start making plans to attend September 28-November 12, 2012. 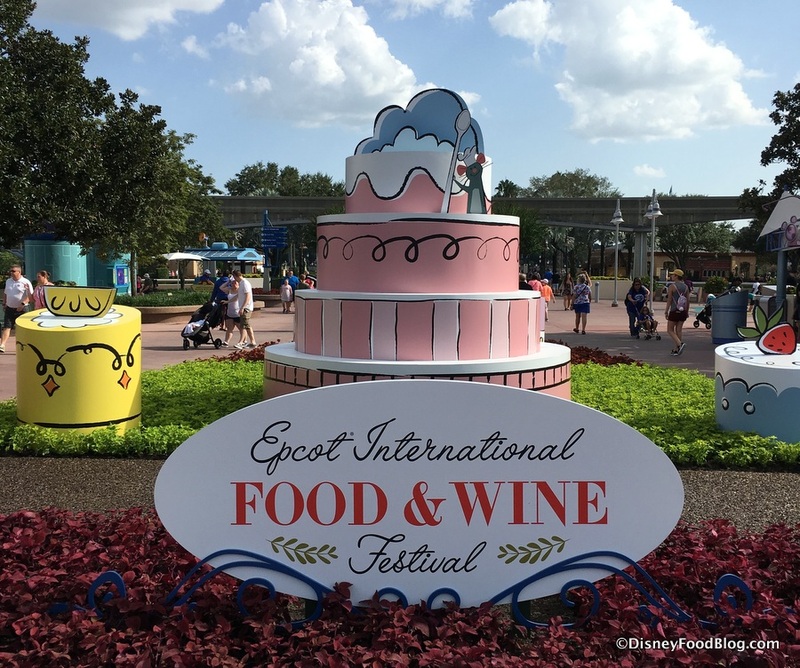 This annual event showcases food, wine, and other beverages from around the globe at marketplaces set up around Epcot’s World Showcase. You can also take advantage of some of the great seminars, demos, and events going on throughout the festival! 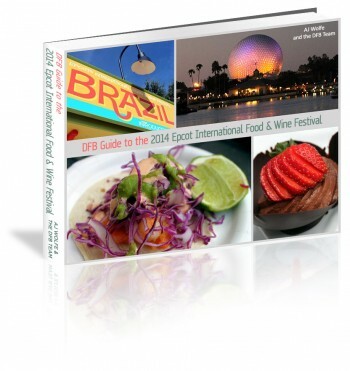 Here are a few of our favorite dining tips when it comes to the Epcot Food and Wine Festival! I hope they’re helpful, and that you’ll share some of your great tips, too! The World Showcase Booths around the Lagoon offer some great eats in small, appetizer sizes! Save one or two (or three!) meals for “eating around the World” Showcase. La Luce has announced their first Wine Dinner at the Hilton Orlando Bonnet Creek resort (within the gates of Walt Disney World Resort!). We love this place for awesome risotto specials each day, killer fresh pastas and sauces, and…wait for it…the Butterscotch Pudding! No, I’m serious! 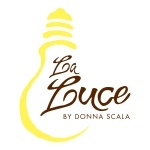 Check out a review of La Luce here. Chef Donna Scala and the La Luce family are proud to announce this Wine Dinner featuring Antinori Wines from Italy. Tables in Wonderland has announced three special events for March 2012 — An Illuminations Dessert Party on St. Patrick’s Day, a specialty Irish lunch at Raglan Road, and a dinner at The Wave! Cost: $55 per person, plus tax. Gratuity is included. 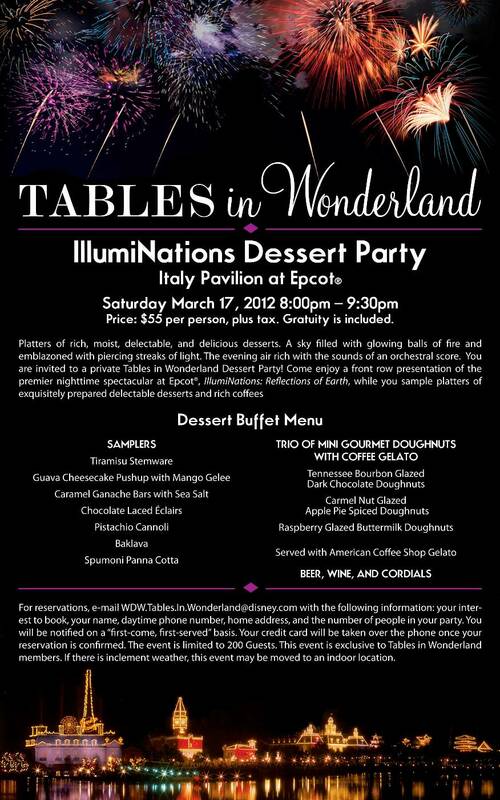 You are invited to a private Tables in Wonderland Dessert Party! 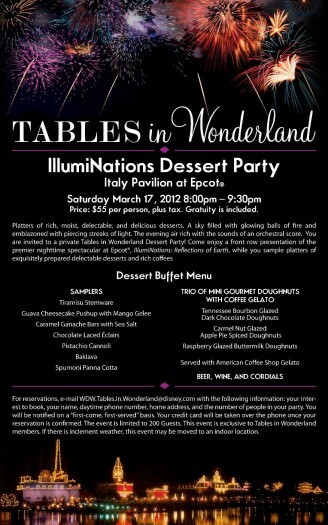 Come enjoy a front row presentation of IllumiNations: Reflections of Earth, while you sample platters of delectable desserts and rich coffees.